Preheat oven to 400 degrees F. Place potatoes on a baking sheet lined with parchment paper or foil. Bake until fork tender, about 45 to 60 minutes. Let rest 5 min. Handling the potatoes with a pot holder, slice each in half lengthwise and carefully scoop out the flesh into the bowl of a food processor leaving a 1/4" rim of flesh to support the potato skin. To the food processor, add the heavy cream, butter, pumpkin pie spice and salt and pepper. Process until potatoes are silky smooth. (Can also be done by hand with a potato masher.) Spray a baking sheet with nonstick cooking spray. 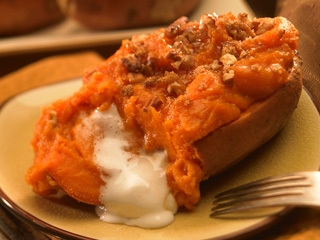 Place sweet potato shells on the baking sheet and add a a few miniature marshmallows to each shell. Spoon or pipe the puree mixture back into each shell. Sprinkle brown sugar and pecans on top. Bake at 400 degrees until potatoes are hot, about 10 to 12 minutes.